Australia’s loss of frog species is, I believe, the worst in the world. We have lost the gastric brooding frog. The corroboree frog, a species that lives in the few really cold parts of the country, is the subject of directed conservation efforts, yet one wonders how it will cope with climate change. Here is a flyer (hopper?) 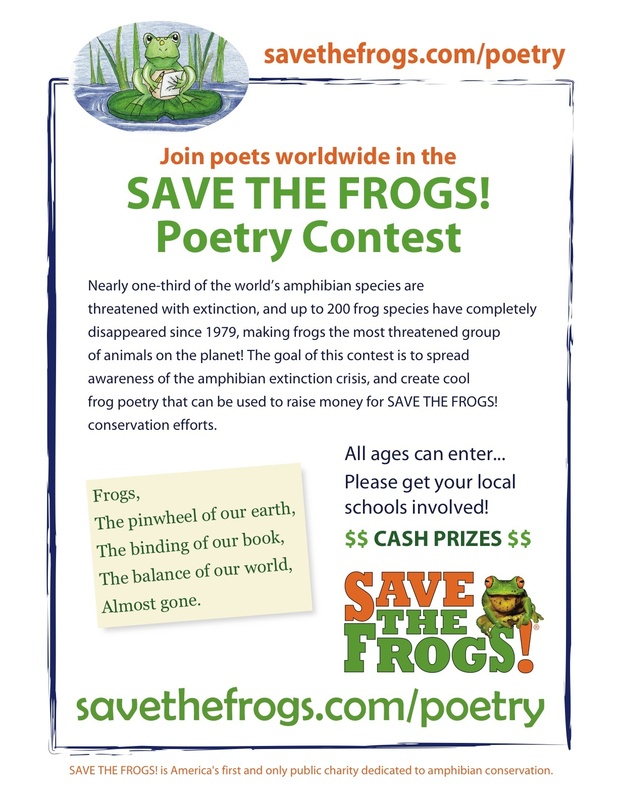 for a US frog poetry competition, because the problem isn’t confined to Australia. Click to enlarge. Here’s their web-site. I have no connection with this group, but it seems like a good way of encouraging people to think about conservation; I’m putting the poster up at my daughter’s school. Following below is a poem about a wonderful night when I saw a road covered with frogs in a jumping carpet. It is biologically inaccurate, but I tried to capture the sense of wonder that came with what seemed like a million frogs. I wonder how long we will continue to see this type of natural phenomenon? walls thin as a yacht’s, teetering near the sea. a rough jagged rain sawed through twilight. We wondered if the house could survive. the black streaming street a foaming river. as it hit the tarmac, transmogrified. placing them on nature strip, dividing green from black. the dark warm curves of the sudden crushing car. never seen since the Walpurgis abandon, that abundant night. that all droughts must break. Our house still stands.